Cruising in Sydney Harbour has touched new, luxurious heights with the arrival of super yacht, Infinity Pacific. Acquired by the Karedis and Laundy families, owners and operators of the Pacific Hotel Group, the 40-metre, three-level vessel is currently the only Italian-built alloy superyacht available for charter in Sydney Harbour, via Ocean Alliance. 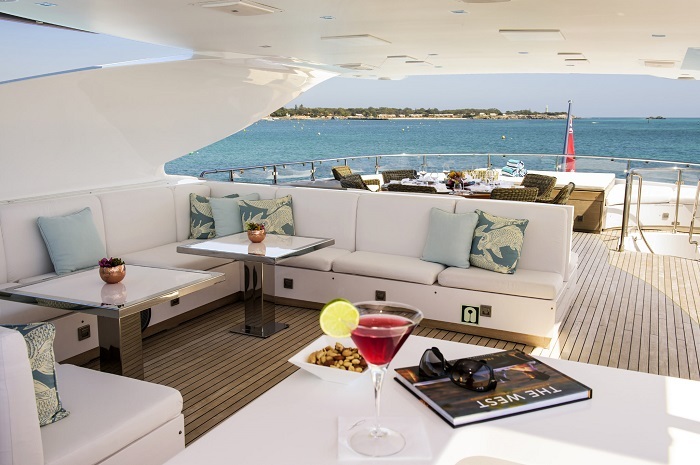 Guests enter directly into the impressive main deck: a comfortable outdoor seating area that leads directly into the sumptuous living room. With interiors designed by Parisian interior architect Fréderic Méchiche and Luca Dini, the ambience is relaxing yet oh so elegant. Although views from the main deck are magnificent, there is more to see upstairs. An undercover viewing deck complete with bar and Japanese-style soaker tub is the perfect place to relax with a sunset cocktail. Downstairs are the living quarters and there’s not a claustrophobic bunk in sight. The master suite is expansive, spanning the width of the main deck and features a gorgeous ensuite bathroom with twin rain showers. 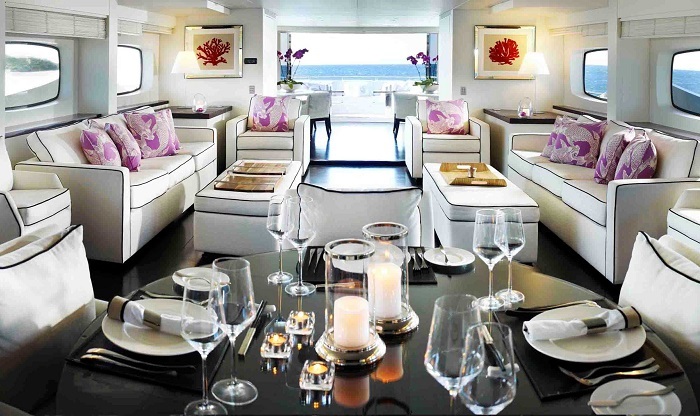 There are four more guest suites, two of which span the width of the boat and all with custom-made furniture and separate ensuites. Infinity Pacific may be hired for a minimum of four hours for events and is the only super yacht on Sydney Harbour that can provide a three course, sit-down menu for up to 20 people. With a menu curated by Noosa Beach House executive chef Peter Kuruvita, guests can expect signature dishes such as a Sri Lankan snapper curry or seared yellowfin tuna with ruby grapefruit, sweet pork and crackling. For larger events, there is a buffet option for 30 people, or up to 50 people can be catered for with a variety of hot and cold canapes, such as Queensland king prawns grilled and dipped in aioli and tasting plates like slow braised beef daube with chargrilled carrots and gremolata. Infinity Pacific has a full-time crew of eight. A complete luxury experience awaits in the chartering of Infinity Pacific for more expansive trips to the Whitsundays, Lizard Island or even the Pacific Islands or New Zealand. Days in the sun are spent enjoying the two-storey high waterslide, Sea-Doo Aqua Lounge and Sea-Scooter on board. Or you might just choose to recline on one of the sun loungers and admire the breathtaking sea vistas with a drink in hand. Proof gigayachts can be both gorgeous and green. The smooth sailing Toro is 26 metres of pure italian indulgence.